This revealing book explores the processes of racialization, class and gender, and examines how these processes play out in the everyday lives of white women living in London with young children. Bridget Byrne analyzes the flexibility of racialized discourse in everyday life, whilst simultaneously arguing for a radical deconstruction of the notions of race these discourses create. Byrne focuses on the experience of white mothers and their children, as a key site in the reproduction of class, race and gender subjectivities, offering a compelling account of both the experience of motherhood and ideas of white identity. Byrne's research is unique in its approach of exploring whiteness in the context of practices of mothering. She adopts a broad perspective, and her approach provides a suggestive framework for analyzing the racialization of everyday life. The book’s multi-layered analysis shifts expertly from intimate acts to those which engage with local and national discourses in more public spaces. 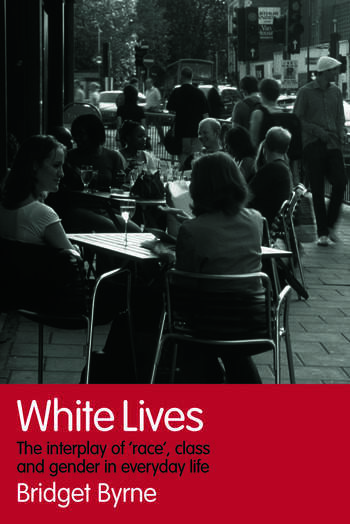 Reconsidering white identities through white experiences of race, White Lives encompasses many disciplines, making valuable reading for those studying sociology, anthropology, race and ethnicity, and cultural studies. Bridget Byrne is a lecturer in Women's and Gender Studies in the Department of Sociology at the University of Manchester.